The Holy See announced June 15 that Archbishop John Nienstedt of St. Paul and Minneapolis has resigned his office. Bishop Lee Piché, an auxiliary bishop, has also resigned. On June 5, the Ramsey County Attorney’s Office filed criminal and civil charges against the archdiocese alleging it failed to protect three boys who were sexually abused in 2008-2010 by Curtis Wehmeyer, a former priest of the archdiocese. Wehmeyer was convicted of the abuse and is serving a five-year prison sentence. He was dismissed from the priesthood in March. 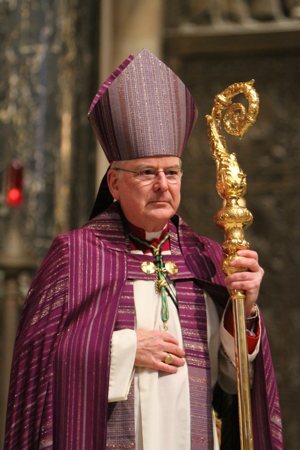 Archbishop Nienstedt, 68, was appointed coadjutor archbishop of St. Paul and Minneapolis in 2007, and installed as its archbishop in June 2008. He succeeded Archbishop Emeritus Harry Flynn, who retired in 2008. Prior to taking the helm of the archdiocese, Archbishop Nienstedt was bishop of New Ulm, Minnesota, from 2001 to 2007, and auxiliary bishop of Detroit from 1996 to 2001. “I also ask for your continued prayers for me,” he said. Bishop Piché, 57, was ordained a bishop for St. Paul and Minneapolis in 2009. Archbishop Bernard Hebda, coadjutor archbishop of Newark, New Jersey, has been named apostolic administrator of St. Paul and Minneapolis. He plans to serve both archdioceses until Pope Francis names Archbishop Nienstedt’s successor. The archdiocese filed in January for Reorganization under Chapter 11 of the U.S. Bankruptcy Code amid mounting claims of clergy sexual abuse. In 2013, the Minnesota Legislature lifted the civil statute of limitations on claims of child sexual abuse for a three-year period. In May, the archdiocese announced that it would sell archdiocesan offices, including the archbishop’s residence, as part of the Reorganization.